So…. If you follow me on social media, you will know that we got a puppy! After Jacob’s passing in June, the house just felt so empty and dogless. After 11 years of my best dog ever being my companion, it was time for us to celebrate him and apply all that he taught us to be a good pet parent again. Introducing my dearest puppy Cami! She has some big paws to fill and we love her to bits. Let’s Celebrate National Dog Day together. 35% hire a dog sitter to visit 2-3 times a day. 40% request walks to be 30 minutes long. 24% of dog training focuses on behavior modification — teaching old dogs new tricks. 59% spend more than $50 to pamper their pooches with manicures, tooth care, and hair trimming. New Mexico is the No. 1 state in the U.S. where dog owners pamper their pets with services, followed by Rhode Island, Arizona, and Nevada. Thumbtack offers a wide-range of pet services, including pet walking, grooming, sitting, boarding, training, photography, and even pet door installation. Here are some fun pet items that you can celebrate National Dog Day with! the KYON Collar -KYON announced the launch of the KYON Pet Tracker, the first all-in-one pet collar that provides a unique opportunity for owners to communicate with their pets. The KYON collar comes equipped with embedded GPS technology and an LED display that makes communicating with pets easier than ever before. The collar works together with a user-friendly mobile application that enables owners to monitor, track, and receive information or alerts about their pets. You never have to wonder or worry about how your furry friend again. 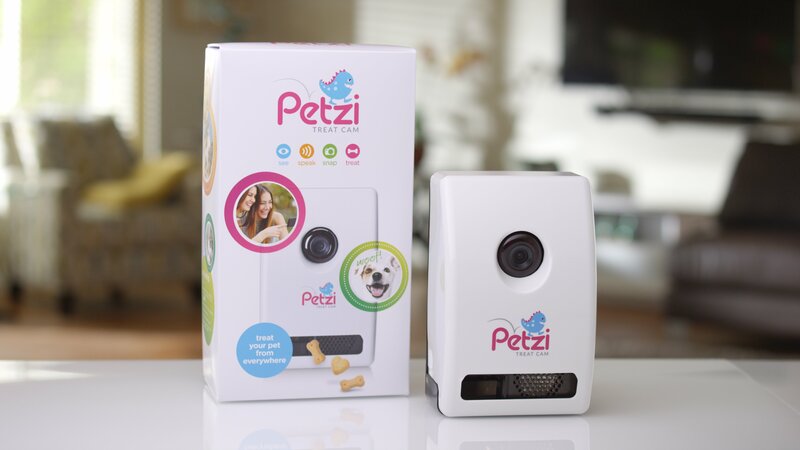 Petzi Treat Cam is a device that seamlessly connects to your home’s Wi-Fi network and allows you to (‘see’) video, (‘speak’) audio, (‘snap’) take pictures and (‘treat’) dispense treats to their pets remotely using any internet enabled smart device. Petzi Treat Cam is available for $169.99 online through Amazon, as well as Best Buy, Bed Bath & Beyond, and PetCo. It’s sure to be a Barktastic device for the days when your fur baby is out of reach. Along with the app isecurityplus.com, this handy pet camera can be view on your cellphone, iPad and computer. It detects motion easily and night vision too. This came in especially handy since we are crate training Cami right now. With a puppy, they can never be left unattended. Pet parents, if you are anything like me, this cool little black camera will give you a peace of mind. Training a puppy means you need treats! You don’t want to give them just anything that will fill them up. When I was at Superzoo, one professional trainer told me that the best treats do not stain, are compact, don’t crumble and won’t melt! The Walgreens new Petshoppe Pet Treat items made with quality ingredients from the Americas or Europe fit the bill for great training. Treats include Chicken Skins, Sweet Potato Slices, Pork Jerky, Crunchy Bites and more. When you live in Vegas, it is pretty much sunny everyday! This cooling mat from Playa Pup is an essential for inside and outside. It gets so hot here that often when we return from walks, Cami literally melts flat on to the kitchen tiles to cool off. Today See Your City campaign was launched, a program designed to motivate New Yorkers and visitors to get the most out of being in NYC and to share their experiences. As part of See Your City, they’re partnering with @BeautifulDestinations to drive awareness and encourage New Yorkers and visitors post content on Instagram using #SeeYourCity. Included is a snapshot of the website showcasing the partnership. NYC & Company, New York City’s official destination marketing organization, encourages visitors and New Yorkers to venture throughout the Bronx, Brooklyn, Manhattan, Queens and Staten Island as part of the relaunched See Your City campaign. Now in its fourth iteration, See Your City originally targeted New Yorkers and has recently expanded to also entice domestic and international visitors to experience NYC like a local. New this year, the campaign highlights an inside look at what to do in New York City through user-generated, visual content on nycgo.com/seeyourcity. To encourage participation on social media, a new See Your City partner, Beautiful Destinations, is sharing New York City moments on Instagram in a way never seen before in their home city. Through preprogram efforts, See Your City has already received more than 4 million impressions from a live, engaged audience on Beautiful Destinations’ Instagram and Snapchat channels. To further promote #SeeYourCity, social media ambassadors—ranging from cultural institutions to local neighborhood influencers to NYC Instagrammers and more—will promote the program by sharing images on Instagram with the official hashtag #SeeYourCity. Additionally, NYC & Company invites everyone to share their must-see pictures throughout New York City’s five boroughs on social media with the campaign hashtag #SeeYourCity. New for this phase, content tagged with #SeeYourCity on Instagram will be featured as travel inspiration on nycgo.com/seeyourcity and the new LinkNYC network. As part of See Your City, founding sponsor American Express is highlighting exclusive Card Member offers, providing extra motivation to explore the neighborhoods of NYC. Eligible American Express Card Members can learn more about these offers throughout the city at amexoffers.com/nyc. American Express Card Members also have more locations to shop while exploring the city, with over 85,000 more places in the New York area accepting American Express Cards in the last two years. The See Your City campaign will be promoted through digital media in addition to bus shelters and street pole banners across the five boroughs; vibrant New York City content seeded through social platforms and highlighted on NYC & Company’s Facebook (facebook.com/nycgo), Instagram (instagram.com/nycgo and instagram.com/nycgo_press) and Twitter (twitter.com/nycgo and twitter.com/nycgo_press) accounts; and through American Express digital channels. The first (October 2014) and second (May 2015) phases of the campaign highlighted neighborhoods throughout the five boroughs and the third phase, See Your City: Eats Edition (October 2015), showcased NYC’s diverse dining scene as a way to explore the five boroughs. See Your City is produced by NYC & Company in partnership with American Express and Beautiful Destinations. NYC & Company is the official destination marketing organization for the City of New York, dedicated to maximizing travel and tourism opportunities throughout the five boroughs, building economic prosperity and spreading the positive image of New York City worldwide. For more information, visit nycgo.com. Beautiful Destinations is the award winning creative agency behind the largest travel and lifestyle community on Instagram, Facebook and Snapchat. The agency creates “social first” content for some of the world’s best brands, governments and NGOs, helping them generate a return on social media through predictive visual analytics and storytelling. With more than 12 million followers in 180 countries, Beautiful Destinations has become the source of daily inspiration for millions of people. The company’s mission is to celebrate the beauty of the world and tell the story of its amazing people, places and experiences. All right stop- turn off the air conditioner and listen! Summer is back with a brand newvengeance – heat, humidity and excessive sweat will wreak havoc on your pores and create horrible acne breakouts without the proper skincare. Ingredients such as cucumber,peppermint and aloe vera protect and cool skin down to lessen irritation and sweat, creating a glowing complexion. Calm skin while hydrating it back to life with a combination of cucumber, chamomile and aloe! This mask will give you relief from summertime inflammation, redness and acne breakouts. This amazing active, anti-bacterial toner that soothes and improves the appearance of oily summer skin! The toner contains citric aid, an alpha hydroxyl acid, which brings hydration and micro-circulation to the skin. Other active and skin soothing ingredients include camphor, eucalyptus, clove, and peppermint. This mask will bring back the glow and reverse summer skin woes with its specially formulated treatment that purifies and re-energizes tired, congested skin and tones to help reduce the appearance of blemishes. Each mask contains a blend of five of nature’s time-proven skin remedies – witch hazel water, licorice root, star anise,green tea extract, and vitamin E, while packing over half a bottle of potent serum in every mask. Loaded with active botanicals, these express facial treatments deliver the vital hydration and nutrients the skin needs to maintain its natural glow.